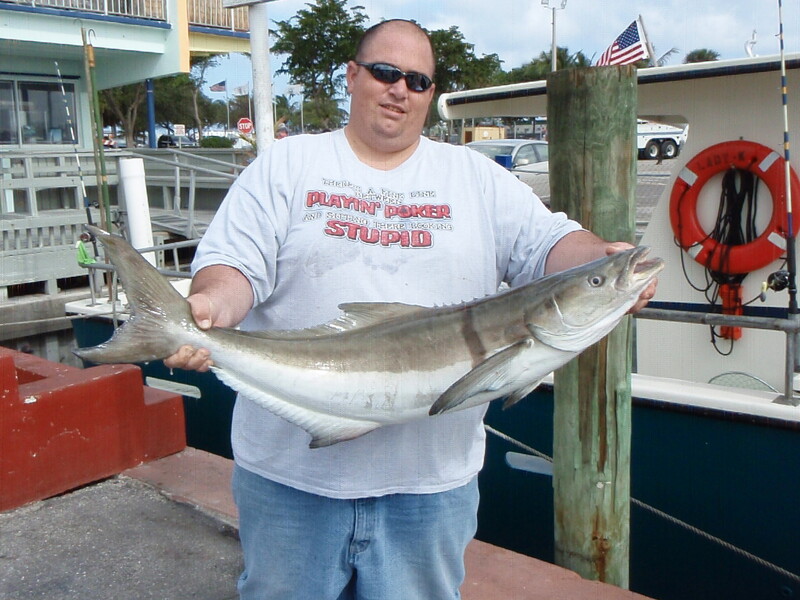 You are currently browsing the tag archive for the ‘deep sea fishing near lake worth’ tag. The Lady K has passed her US Coast Guard Safety Inspection with flying colors and now its time to resume fishing off the South Palm Beach County coastline. VIP angler Victor fished with his dad during a morning trip and caught this 33 pound, early winter Cobia while spooling a bait on the bottom. During the trip other anglers enjoyed action provided by King Mackerel, Mutton Snapper, Yellow-tail Snapper, small Sharks, Banded Rudderfish and Gray Triggerfish. If fishing a drift bait doesn’t work for you, ask one of your experienced crew members for a bottom rod and enjoy hooking up on a different fish species on every drop. 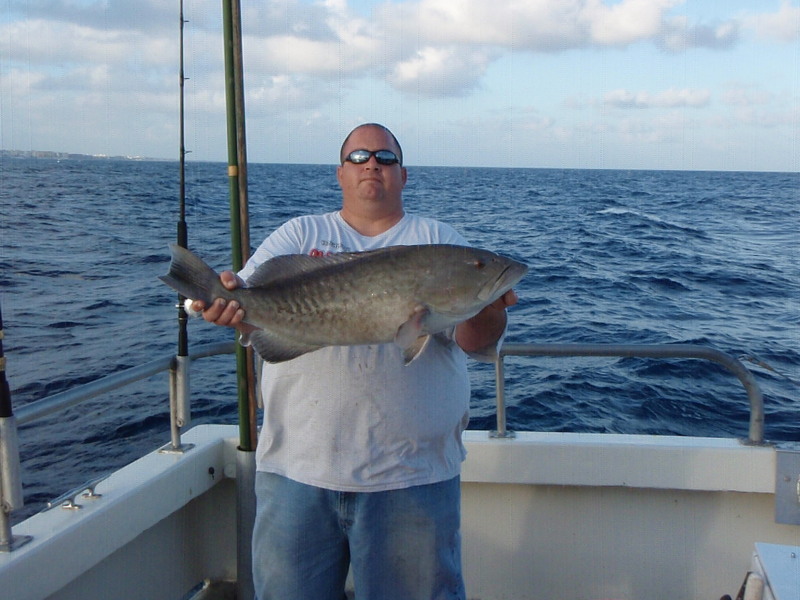 Catch and Release fishing has also been good for anglers fishing aboard the Lady K. Closed seasons on Vermillion Snapper, Black Sea Bass and all Shallow Water Grouper (like the nice Gag Grouper pictured above) continue to provide action (although disheartening) for anglers. The passing cold fronts have also allowed some lucky anglers to catch and release Sailfish throughout the week. The Lady K promotes catch and release fishing while encouraging anglers to bring along a camera for a quick snapshot of their catch before releasing so our younger generation of anglers can enjoy battling a fish in the future. Plan a trip today aboard the Lady K and don’t forget that we also offer night fishing from 6:30 pm to 10:30 pm (with a minimum of 7 anglers for evening trips), so bring a friend and open the bail in order to place a fish in the pail! 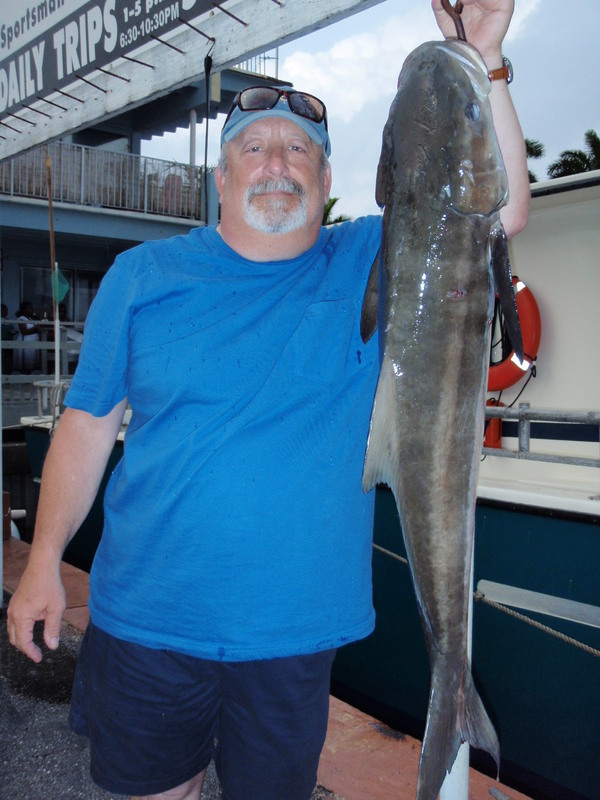 VIP angler Ken displays a beautiful 29 pound Cobia landed aboard the Lady K during an afternoon trip. The fish ate a sardine spooled along the bottom and for a few moments, that’s exactly would Ken thought he hooked. After a comment on how well the captain tied his knot, the captain grabbed the line to see if the line would come free of the reef and the “reef” started moving. The fish put up a fierce battle to the vessel making three hard runs back down to the reef looking for any obstruction to free itself. Ken kept a light steady pressure on the fish letting the rod wear down his adversary and allowing the crew to boat the fish. Nice job Ken! Other fish being landed aboard the Lady K this week include Yellow-tail snapper, King Mackerel to the 20 pound class, Porgies, Gray Triggerfish, a few Mutton snapper, football sized Black-fin Tuna and False Albacore. All grouper must be released until the season opens again May 1st as well as all Vermillion snapper until their season opens on April 1st. Fishing is good rain or shine, day or night. Get hooked on a good time with the courteous crews of the Lady K – service with a smile.